Didn’t you know? There’s no such thing as a Gruffalo! Except there is, in a cake box in my kitchen, made by me! Check it out! 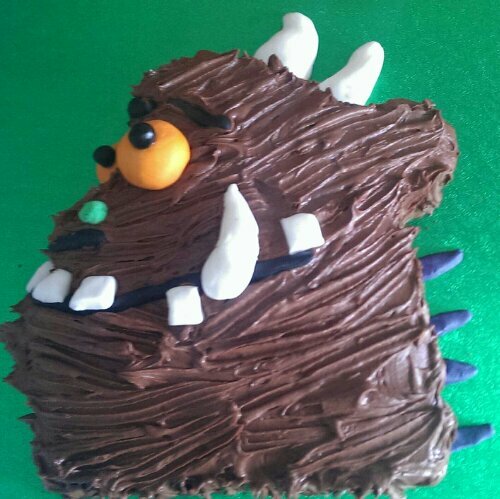 A friend asked me to bake a Gruffalo cake for her son’s birthday. I wasn’t convinced I could, but decided I’d give it a go! This was the test run, and I am so proud of it. It’s even made it onto the Great British Bake Off website, along with the fantastic, amazing cakes others have made. I’m just over the moon with it! I’ll be making another for the actual party. As I say, this is just the test run. So now I’ve got to figure out what the hell I can do with a giant chocolate Gruffalo? 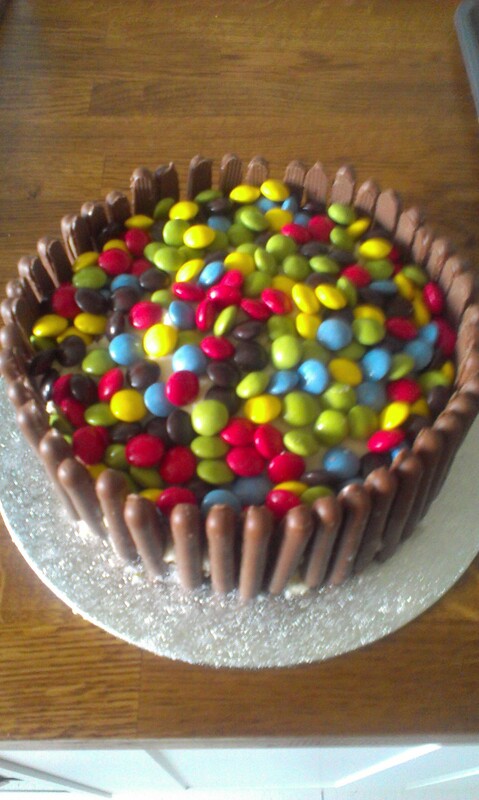 Hot on the heels of my Messy Church cake success (the kids loved it, and it sent everyone home completely wired! 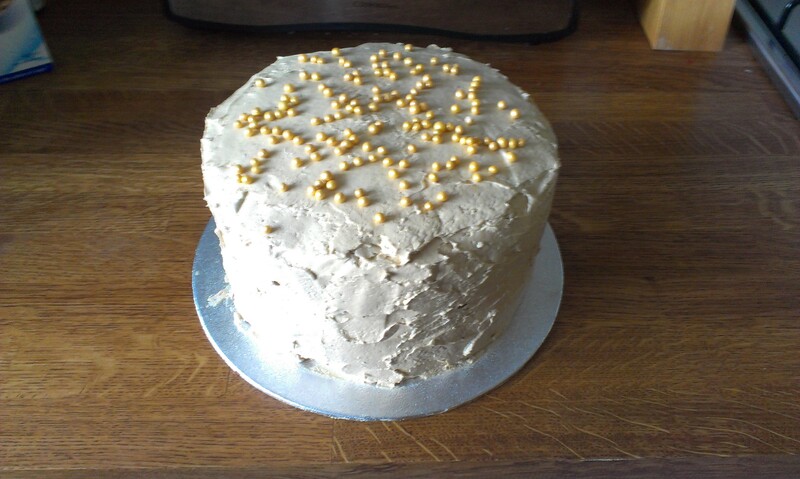 ), I made a birthday cake for a colleague. I decided on a spiced apple cake from the Hummingbird Bakery’s “Cake Days” book, and oh my word! It may just have been the most fabulous cake I’ve ever made! The cake has caramelised apples and lots of pecans in it. The frosting is a very light meringue frosting. It is made with dark brown sugar, which gives it a fabulous toffee-like flavour. I think you’ll agree that it is a much more sophisticated creation than my last cake! Not a drop of food colouring in sight – I have actually been forbidden from using food colouring again until I find a suitable covering for the kitchen counter, as a splash of blue somehow found its way onto the new oak worktops :-0 I had to sand it off! Many of my cakes recently have included a lot of food colouring. Much of my baking is done with the “help” of my gorgeous 4 year-old niece, and she just loves rainbow cake! And my job as an aunt who bakes is to make sure plenty of rainbow cake is made! When we tasted this apple cake, having kept a tier back for “quality control”, I asked my OH where she thought it ranked in my all time league table of cakes! Her response? “Slightly below your lemon cake, but definitely above anything that has ever turned my poo green!” (I used a bit too much food colouring in one rainbow cake, and toilet trips were interesting for a couple of days after! Sorry if TMI!). Another successful baking adventure then! My waistline probably requires me to wait a little before my next one. I just love to bake. If I can find an excuse, I’ll bake for ages! Today I’m helping out at a Messy Church session at work, and I volunteered to make the cake. Here it is, in all its glory! 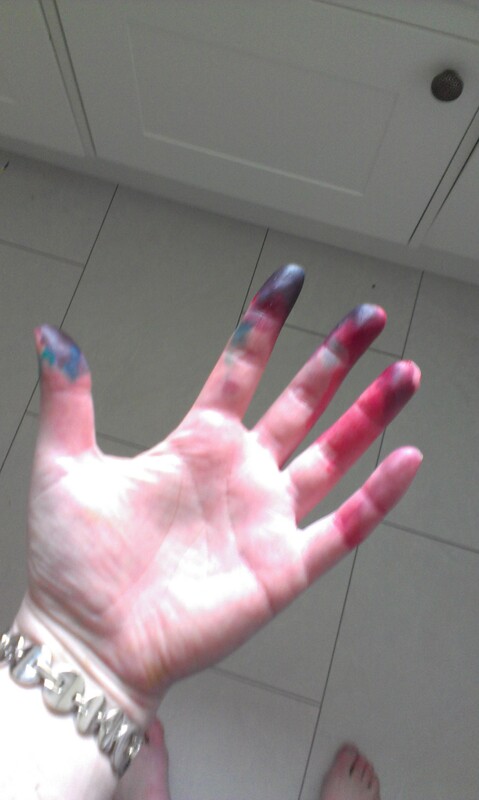 It’s multi coloured on the inside, so my hands look fabulous from all the food colouring! Also, I found this organisation yesterday, which I think looks fab http://www.freecakesforkids.org.uk My cake decorating skills are somewhat limited, but I am learning (trial and error mainly). So I got in touch with our local group to offer my “expertise”. Maybe nothing will come of it, but I just think it’s a lovely idea. People might think the idea that parents might not be able to give their kids a birthday cake is stupid, but I really had my eyes opened to poverty in the UK recently. I was doing some workshops in a local school in one of the poorest areas of the city, and the teacher asked the kids to finish their work at home, as it was the end of our session. And a little girl put her hand up and said “but I can’t, my mammy doesn’t have enough money to buy me some colouring pencils” and it just broke my heart! I spoke to the teacher about it, and he said that the majority of kids in that school only got one decent meal a day, and that was their free school meal. It made me so sad! I really hope I can get involved with free cakes for kids. My mam spent hours making all kinds of fancy birthday cakes for us when we were growing up (my fairy castle was a particular highlight) and a funky cake just really helped make a birthday great and helped give such good birthday memories. If I could help a kid get some good birthday memories in spite of family difficulties then that would just be great! My next baking adventure is again for work, and I’m trying to figure out if I could make a more adult themed cake, perhaps a male torso with six pack for a guy at work… maybe that’s a bit ambitious.